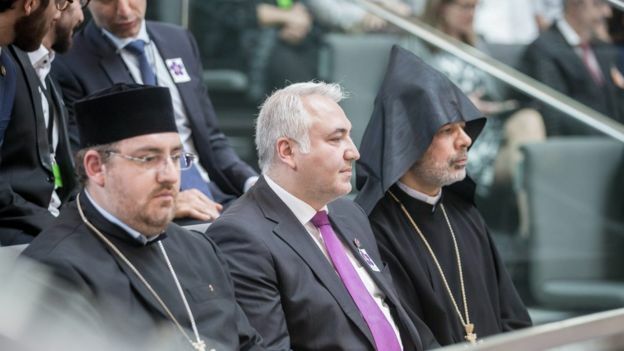 The German parliament has approved a resolution declaring that the mass killing of Armenians by Ottoman Turks during World War One was a “genocide”. 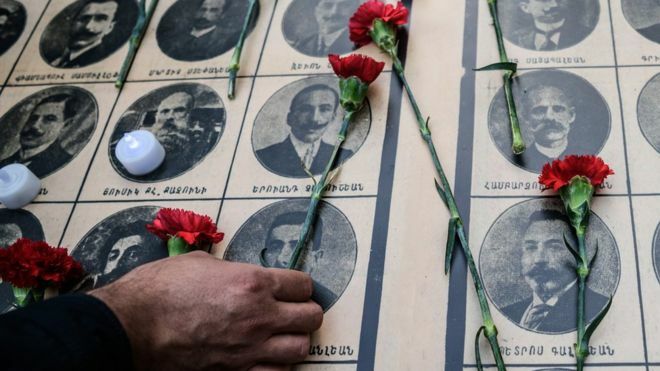 Armenians say up to 1.5 million of their people died in the atrocities of 1915. Turkey says the toll was much lower and rejects the term “genocide”. The vote heightened German-Turkish tensions at a time when Turkey’s help is needed to stem the flow of migrants. Turkey has recalled its ambassador and its leader threatened further action. President Recep Tayyip Erdogan said the recall was a first step and that the government would consider further action it might take in response to the vote. “We will do whatever is necessary to resolve this issue,” he said. More than 20 nations, including France and Russia, as well as Pope Francis, have recognised the 1915 killings as genocide. Turkey denies that there was a systematic campaign to slaughter Armenians as an ethnic group during World War One. It also points out that many Turkish civilians died in the turmoil during the collapse of the Ottoman Empire. Mrs Merkel was not in the Bundestag (lower house) for the vote. Her Christian Democrats (CDU), their coalition partners the Social Democrats (SPD) and the Greens all supported the resolution, and the vote in favour was overwhelming. German MPs came under pressure from Turks in the run-up to the vote, receiving threatening and abusive e-mails, German ARD news reports. The resolution uses the word “genocide” in the headline and text. It also says Germany – at the time an ally of the Ottomans – bears some guilt for doing nothing to stop the killings. The reactions from Ankara are every bit as strong as feared. Turkey’s foreign minister even accused Berlin of trying to deflect from the dark episodes of its own history, a clear reference to Germany’s Nazi past. But for many German politicians this vote was about exactly the opposite: it was about dealing with not just Turkey’s difficult 20th century history, but also Germany’s. Many of the speeches in parliament focused on German responsibility in the 1915 killings. At the time, the German empire was a military ally of the Ottomans, and is accused of knowing about the massacres and not doing anything to prevent them. So for many Germans this resolution is about facing up to German historical guilt – something modern Germany is founded upon. But the big question is what this all means for Europe’s attempts to solve the migrant crisis. Diplomatic relations may be strained. But the hope in Berlin is that tensions don’t scupper the EU’s new refugee deal with Turkey.